Yevgeny Abramovich Baratynsky (Russian: Евге́ний Абра́мович Бараты́нский; IPA: [jɪvˈɡʲenʲɪj ɐˈbraməvʲɪtɕ bərɐˈtɨnskʲɪj]; 2 March [O.S. 19 February] 1800 – 11 July 1844) was lauded by Alexander Pushkin as the finest Russian elegiac poet. 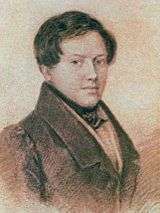 After a long period when his reputation was on the wane, Baratynsky was rediscovered by Russian Symbolism poets as a supreme poet of thought. ↑ Surname also spelled Boratynsky (Russian: Бораты́нский). 1 2 3 4 5 6 Mirsky 1927. 1 2 "Prominent Russians: Yevgeny Baratynsky". TV-Novosti. Retrieved January 1, 2012. ↑ Mirsky, D. S. (1958). "The Golden Age of Poetry". In Whitfield, Francis James. A History of Russian Literature from Its Beginnings to 1900. Evanston, Illinois: Northwestern University Press. p. 104. ISBN 9780810116795. Retrieved 2016-01-29. 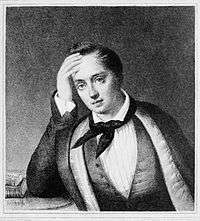 In 1843 Baratynsky left Moscow for a journey to France and Italy. 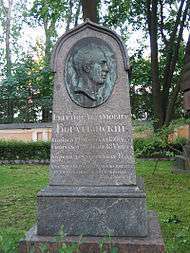 He died in Naples, of a sudden illness, on June 29, 1844. Chisholm, Hugh, ed. (1911). "Baratynski, Jewgenij Abramovich". Encyclopædia Britannica (11th ed.). Cambridge University Press.